I had a wonderful final night in San Pedro just chatting away. Making friends while travelling is very different – despite spending such a short time together, friendships become strong quickly. People tend to be more open, and often talk frankly and honestly about topics usually never broached or cautiously sidestepped back home – dreams, faith, philosophy… (Also, I learn interesting things, like that tiny owl hiding in the corner of the US $1 bill! Never knew.) But alas, I had to leave early the next morning for my 9:30 bus, and I said my goodbyes to Beto, Jimbo, Pamela, and Sofi. Or so I thought. My hostel was just outside of customs, and we were stuck at customs for a whole 3 hours. Frustrated with that, I ran back to my hostel and hung out with them one last time while waiting for the several hundred people to pass. More hugs, but also more goodbyes – those are always tough. Well, at least I know now I definitely want to return to Chile someday, not just to see the places I’ve missed, but at the very least to visit some great friends! Thus, the 10 hour bus journey became 15 hours. (3 hours at Chilean customs, 1 hour at Argentinian customs, and an extra hour of being stuck behind an accident.) Cheesy movies aplenty (including a far too overly preachy Christian one and Shrek 2, both dubbed in Spanish with odd bits whenever the respective original movies actually had Spanish dialogue), but an open bar of soft drinks and plenty of snacks provided. We took a very high mountain pass – Paso Jama – and the scenery was spectacular, with winding roads reminding me of the Himalayas. Big hills, cacti, salt pans, cliffs of all sorts of colours, and dangerously curving roads. I think we were moving at about 40 km/h going through Quebrada de Humahuaca (an area I unfortunately have to skip due to time constraints, but at least I got to see some of it through the bus window). That night at my hostel, I ran into Chris (Switzerland), who I met waaaay back in Buenos Aires. New record for biggest gap between run-ins? 6 weeks. Well, the next day rolled around and I didn’t hear from Alvado. Instead, I found two people who were also on my bus at the hostel – Matt and Tess, a young couple from England. 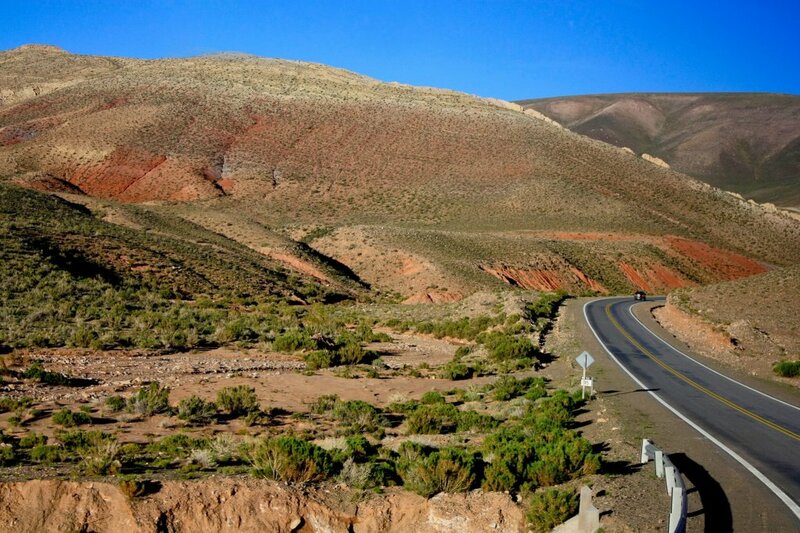 We all had the same plan, to stay in Salta until the following night, then make our way over to Tupiza, Bolivia. After buying our bus tickets together, we walked around town and headed up the teleférico (cable car) to Cerro San Bernardo, where we got a nice view of the city before walking down. Turns out that the Monday was a public holiday – most cafes were closed, and so were all the museums. 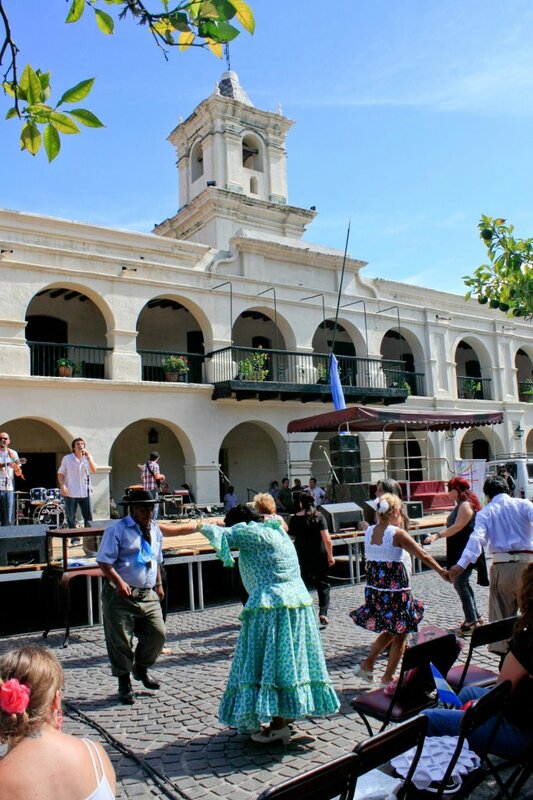 However, there was a music festival going on in the main square of Plaza 9 de Julio! After a lunch of humitas (steamed mashed corn), we hung around and enjoyed the music. The first act we saw was wonderful – a mix of guitars, ukulele, horns, and blowpipes; hard rock, pop, and local folk music that got plenty of locals dancing. In the setting of the elegant plaza, it was perfect. I only wish I knew their name! Well, after they finished their act, the next one was heavy metal…decent, but decidably less suitable to the setting. Off to buy some helado! In the plaza, we passed by a woman feeding a giant group of pigeons, while gesturing up in conversation with Matt and Tess. It was then I realised that these pigeons were quite spoilt – whenever I threw my arms up, as if I were throwing some seeds onto the ground, they would fly or twitch! Hahaha…had some fun with that. Back to the old Argentinian quirks – while buying some lotion (much needed after dry, dry San Pedro) at a supermarket, I witnessed a woman in front of me being offered a packet of water flavouring rather than be given 4 pesos in change. Heh. We also passed through several pedestrian-only shopping streets. Like most Argentine cities, vendors lay a cloth on the ground and sell their wares. Unlike other cities, these wares mainly consisted of underwear. I wonder if anyone ever impulse-buys. There were plenty of electronics stores on the pedestrian streets as well, selling the usual computers, music players, TVs, and laundry machines…and also motorcycles! Huh. After I returned to the hostel, I received a call from Alvado via the hostel. He told me he was heading to a peña (live folk music restaurant) with the girl, and that he’d call back in an hour. Aaaand then he didn’t call until I was about to head out two hours later. With Matt and Tess in tow, we resolved to meet up at a street corner in the peña district. Aaaaand then no one was at the street corner. A little bit fed up, Matt, Tess, and I pick a peña recommended to us in our guidebooks…and about half an hour later, we find Alvado and company sitting at another table! We acknowledged each other’s presence, but he left before I had a chance to go up and say hi. Never saw him again. Huh. Okay, the peña itself though – that was pretty cool, if a little touristy – I don’t think anyone from Salta was in that restaurant, although there were plenty of people from Buenos Aires. The live band played some awesome folk music, the four of them in harmony, and once in every few songs, two pairs of dancers would come up. While the girls swirl around gracefully in their flowy dresses, the gauchos really stole the show. Wearing heavy belts and even a dagger or something, they’d do some weird manuever that was equal parts tap-dancing and contortionism, so fast you can’t catch it on camera. They also had these mega-serious looks on their faces. The food was also something new for me – I tried cazuela de llama, a hearty, borscht-like stew of llama meat. Llama itself tastes like lamb, and the cazuela was nice and spicy. In typical Argentine fashion, we had gotten to the restaurant at 11, started eating at 12, and left the restaurant after enjoying the performances (which were still going!) at 2 am. Lovely, but tiring night. Today, the three of us headed to el Museo de Arquelógio de Altas Montañas (High Altitude Museum), detailing Inca civilisations unearthed in the Andes, and particularly the Salta region. Their most prized possessions, of which one is on exhibit, is of three children who were sacrificed and buried. The cold weather at the altitude which they were excavated from is so cold that they were perfectly mummified – in fact, they are the world’s best preserved mummies. To please the gods, Incans would choose the most beautiful children, hold elaborate ceremonies (I can’t quite remember if they all involved marriage of the children), then feed them some alcohol and bury them after they fall asleep. Their belief was that the children didn’t die – rather, they would be sent to the skies to look over them. From that, I can only imagine that this must’ve been an honour that children were willing to partake in! Really not sure if I’m extrapolating too far though. As the heat was unbearable, we sat around all afternoon until dinner time. One last meal in Argentina! Upon Beto’s recommendation back in San Pedro, I knew I had to get some bife de chorizo. Glad I convinced Matt and Tess to come along – that bife de chorizo (along with some fries and an extra chorizo sausage) was enough to feed all three of us! 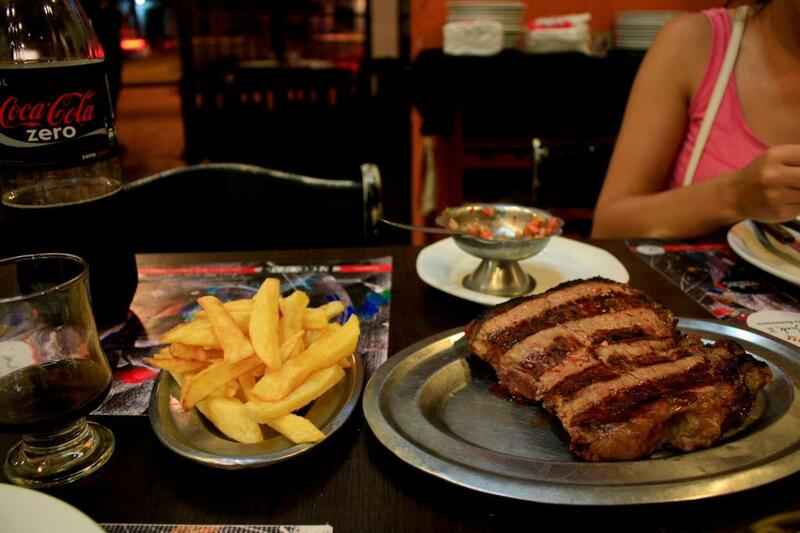 A steak the size of a plate, super thick, and one of the juiciest I’ve ever had…only for 80 pesos ($20). Can’t imagine ever getting that back home. It’s time for the bus to the border. 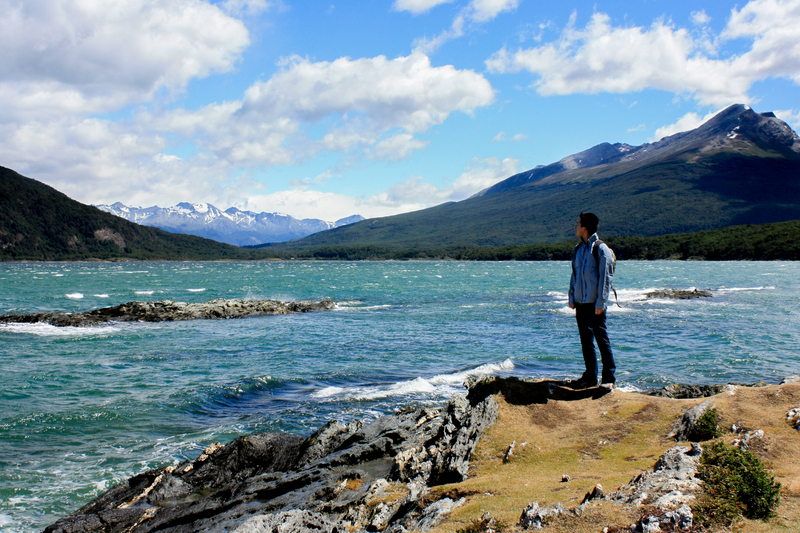 Goodbye, Argentina… I’ll miss your awesome food and music and funny habits and scenery and everything. See you again some day!